Approximate heestorical distribution o Semitic leids. 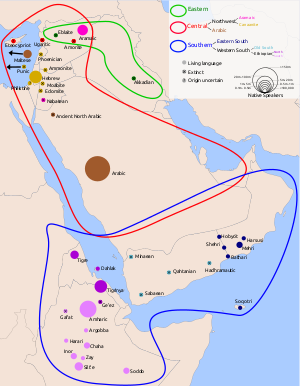 The Semitic leids are a branch o the Afroasiatic leid faimily oreeginatin in the Middle East. ↑ Nordhoff, Sebastian; Hammarström, Harald; Forkel, Robert; Haspelmath, Martin, eds. (2013). "Semitic". Glottolog. Leipzig: Max Planck Institute for Evolutionary Anthropology. This page wis last eeditit on 7 Apryle 2016, at 04:11.